What Is The Best Beginner Sewing Machine To Buy? How to Buy a Sewing Machine For Beginners? Finding the perfect sewing machine can be intimidating, especially when there are so many types, brands, and models. Machines that come with zillions of features, attachments, accessories that initially don’t make sense. And it can be slightly more difficult if you are a beginner who just wants to own an entry-level and affordable machine and begin your journey as a creative seamstress. 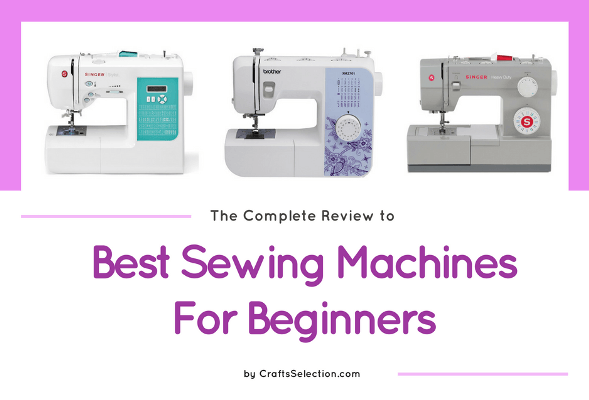 We understand your needs and have thus created this brief buying guide to help you find the best sewing machine for beginners. As experts, we believe that the easiest way to find the best one is to compare sewing machines. Weighing their pros and cons, understanding their highlights, and most importantly, gauging the overall user experience is how we have compared these models. If a certain machine seems like a nice deal and is also in your budget, you have probably found your sewlmate. Once you have taken a look at the table, the brands, and the models, it is time for in-depth sewing machine reviews. A machine known for its versatility, it is suitable for both users who are learning to sew (thanks to the instructional DVD) and for those who are in inching closer to the intermediate level. A beginner user is going to have a lot of questions when she/he begins the sewing journey. All sorts of words – bobbin, feet, stitch type, blind hem, etc. – will come your way and fly over your head. That is why we suggest the Brother XM2701 – a basic sewing machine that takes care of a beginner sewer like a teacher takes care of a pupil. Its tutorial DVD and simple user manual are perfect to understand all the basic tasks like setting up a stitch, threading a needle, and using one of those 27 built-in stitches. The in-built needle threader saves time and effort as you don’t have to hunch over the machine and find the eye of the needle before you can start sewing. The 1-step buttonholer is also a great accessory if you are, say, a mother-to-be who wants to gift her child a cozy sweater with 2-3 buttons. Creating buttonholes otherwise is a tedious task. If you want a machine so that you can learn to sew easily without any overwhelming operations, don’t think twice. Just order! 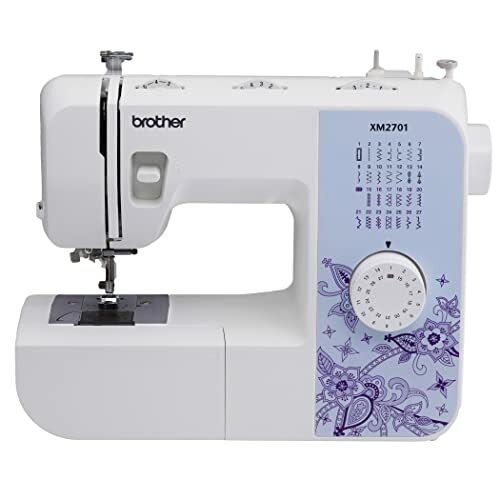 Priced less than $130, Brother XM2701 is the best budget sewing machine in the market. Ideal for people who want to take care of everyday tasks with minimum or no knowledge of sewing. The free arm makes it easier to sew smaller areas like pant seams and children’s clothing. It is the perfect tool to up your stitching game. If you are the type of person who wants to get down to the business of learning sewing as soon as the shipment arrives, then this small sewing machine Brother XL2600i is perfect for you. It is easy to start with, has simple directions in the user manual, and has in-built stitches that are pretty self-explanatory. The free arm is meant to provide you with a proper setup to sew smaller areas (e.g. : sleeves). Since such parts are circular in nature, the arm can be removed for a better knack. You may not realize it as you start, but later in your learning curve, you will thank yourself that you opted for a free arm machine because it is pure magic. The user manual also has instructional charts for you to follow. It has detailed info about the thread, stitch size, tension, and needle that you will require for specific jobs. Want to stitch a quilt? Check the chart. Want to quickly work on your tank top? It’s easy as ABC. Sewing is like a dream with the XL2600i. 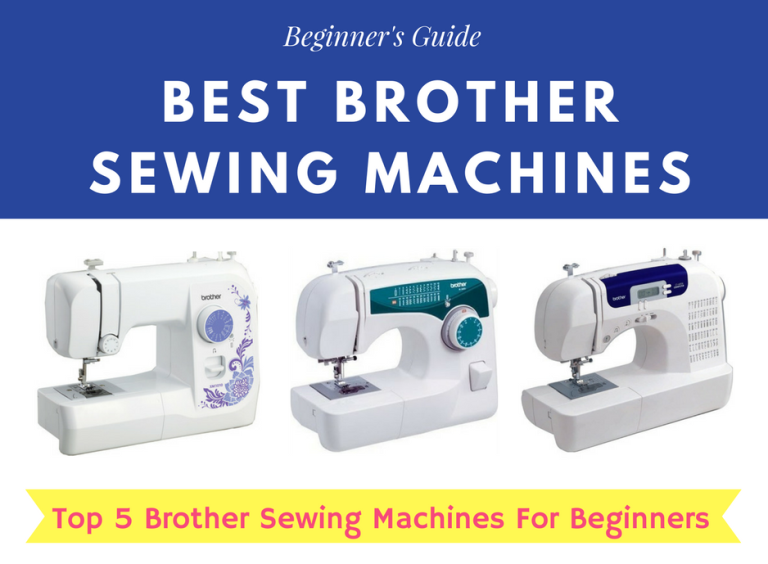 Brother is one of the leading brands in the sewing machine industry, and this model here comes highly recommended by both experts and home users. If Brother is a leader in the industry then Singer is the household name. As a beginner, you will watch a lot of instructional videos online. Which brand are you going to see a lot? No prize for guessing. Hobbyists and DIYers who want to make artistic creations are going to fall in love with this machine. Its set of 76 decorative stitches also makes it perfect for a fashion design student. Singer is a crowd favorite because of a variety of reasons. More than the features, it’s got traditional value. Most old school sewers preferred Singer over other brands like Brother and Pfaff. Whether you are just beginning to learn sewing or are a seasoned hobbyist, the Singer 7258 computerized sewing machine is perfect for you. Apart from the normal set of features for beginners, it has more inbuilt stitches than Brother models reviewed above, has a brighter work area for paying extra attention to details, has computerized controls for easy management, and an instruction manual that is slightly better designed (pictures) than those of Brother’s. Also, the ability to stop the needle up or down will be a lifesaver once you start learning the art. This Singer sewing machine is arguably the best computerized sewing machine for beginners because even after you become an intermediate sewer, it will still be contemporary to your sewing needs. If you are new to sewing and want to get a fancy one, then buying this Singer sewing machine perfectly makes sense. For an advanced user, the features may look inadequate, but for a beginner, they are hardly overwhelming. It’s so simple, it’s fantastic. Janome is another household brand that has its roots in Japan. We already know that Japan is a leader when it comes to consumer electronics, and Janome’s machines are a great testament to that fact. A good sewing machine is dependable, lasts for years, and is robust. Exactly what Janome’s models are. 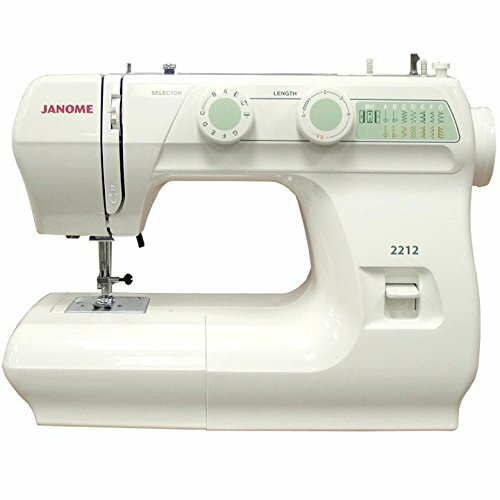 People who are looking for a sewing machine that is within the budget, that is easy to use with a detailed manual, and can be used for a variety of purposes should consider the Janome 2212. Please note that it is a mechanical sewing machine, compared to the computerized one by Singer above. An easy-to-use machine without the extra baggage of large in-built stitches. This Janome sewing machine for beginners is designed in such a way that a user does not get lost while working on it. Easy selection of switch aside, it also comes with a free arm for all those tiny projects. The 4-step buttonhole requires the user to change the dial position between marks (usually A, B, C, and D) to complete the process. This is a meticulous way of stitching a buttonhole as you can easily choose the button size using the scale on the buttonhole. A mechanical machine can be easily fixed at a low cost whereas a computerized one will need a detailed overhaul and is quite expensive. There is not much difference between these other than the way in which you select modes and stitches. The Janome 2212 sewing machine is also perfect for young girls and boys who have joined sewing classes and would want to carry it. It’s lightweight (around 15 lbs.) and easily portable. If too many features intimidate you then this best Janome sewing machine will be a perfect match. It will not give you any issues even if you use it daily, thanks to the cutting-edge Japanese technology. 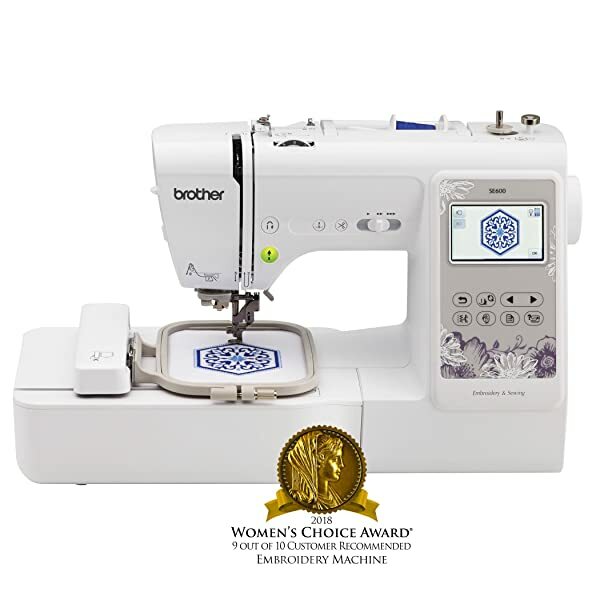 If you are looking for an all-in-one yet basic package that is perfect for sewing, quilting and basic monogramming, then the Brother HC1850 is your best bet. Brother HC1850 is the best sewing machine for quilting. If you are looking for an inexpensive and computerized sewing machine with the added functionality of quilting, then your hunt ends here. The biggest advantage of having a detachable wide table is that for quilting you need a large space, which is not possible on a regular sewing machine. Starting up with a quilt stitch function is very easy in this model. You just have to follow the tutorial in the DVD, select the appropriate quilt stitch from the chart, and voila! Beginners are going to have a field time with this machine as diagrams and steps can be found right on the machine; automatic needle threader and lifter are also present, life-saving 30-minute instructional video perfect for beginners, and powerful LED lamp above the work area. Since it allows operation using both pedals and hand controls, you can switch to the latter whenever you want to rest your feet. It’s a great benefit for sewers who are running a small business. Since they work continuously for hours, then can give some respite to their feet. If basic quilting is something extra that you want from your first sewing machine then the Brother HC1850 sewing and quilting machine is a perfect choice. 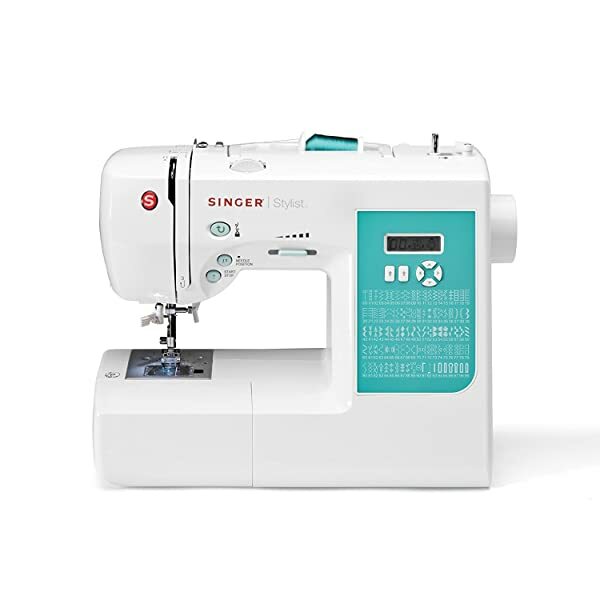 Although known for its intelligent embroidering capabilities, the Brother SE600 is also a powerful standalone sewing machine apt for beginner fashion students and hobbyists. It is highly regarded in the stitching industry and is Brother bestseller. Those looking for an extra dash of embroidery can go with this model. 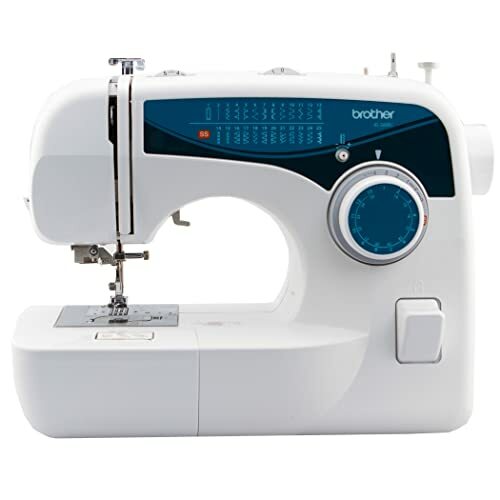 Although the Brother SE600 is capable of sewing, quilting, embroidering, and even appliqueing, we suggest you to first narrow down your requirements before going with this or the previous Brother model. If you plan to carry out embroidery in future (say, as a home business person), then this is the best entry-level machine. It has 103 built-in stitches which are more than necessary for your starter needs. What sets it apart from other models reviewed here is the color LCD touch screen. Say goodbye to knows and buttons; you can navigate all menu functions from your fingertips which we are sure you are already well-versed in, thanks to your phone. In addition to the essentials like automatic needle threader and drop-in bobbin system, the Brother SE600 Computerized Sewing and Embroidery Machine also has a series of extra features intended for embroidery that make sewing super easy. For example, take the automatic thread cutter, which helps you get the finished product without having to look for tools like scissors or cutters. It also comes with several sewing feet so that all your sewing tasks can be taken care of easily. A lot of people are going to tell you that the Brother SE600 is suited for a future embroiderer. However, we tend to disagree because, in our research, we found that its features improve the sewing operations, undeniably making it the best sewing and embroidery machine. The Brother SE600 can do a lot of things that you will learn once you begin your sewing journey. If you want to stay ahead with technology, but on a budget, this is the best affordable embroidery sewing machine to go for. Those who are on a budget but are ambitious about their future sewing projects need to get their hands on this low-cost computerized top selling sewing machine. Think of all the things you would ever want to do with your sewing machine. Then think of a little more. Then buy Brother CS6000i. Have you ever wanted to own an entry-level sewing machine that would just take care of your occasional stitching and hemming needs? Do you occasionally want this very machine to grow a free arm so that you can finally repair your sleeve? Let us present you the best affordable sewing machine for beginners. You already know the benefits of having a free arm, but what is better in this model is the wide work area. 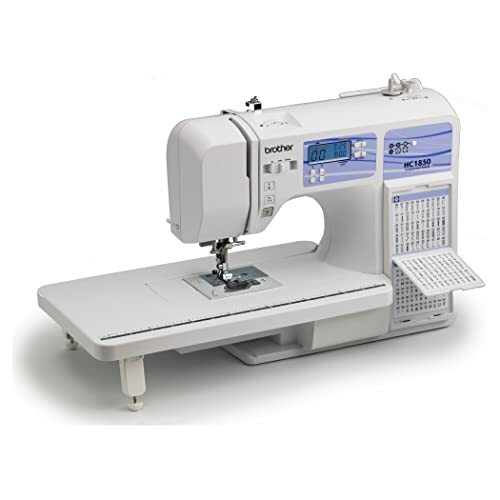 With enough space to manage your material, the Brother CS6000i makes it easier for beginners to slowly guide and maneuver their fabric as they sew. The variable speed control feature lets you slow down, especially for those meticulous stitches that need extra attention. It’s a great feature that makes even experts sewer to fall for this little, lightweight machine. It comes with a pack full of accessories, all of which are going to excite the artist in you. There are a lot of possibilities with this model, and when you relate it to the price, you are going to laugh your way to bed tonight. 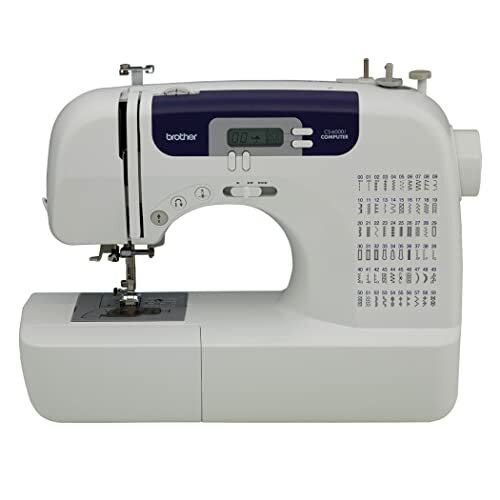 Another top rated sewing machine, Brother CS6000i is often called the best value sewing machine as it has everything that a user can ask for in a single package (easy-to-use and versatile) but at a very low cost. It sews smoothly without drilling a hole in your pocket (pun unintended, again). Overall, we think that these are the top seven sewing machine models well-suited for beginners. Going through the reviews and matching the pros/cons with your requirements can give you a better idea of what to expect and which on to go for. If budget was the main issue, we’d recommend Brother CS6000i, that takes care of almost everything from a beginner’s perspective. Next, comes the versatile and hugely popular Brother SE600. The biggest advantage of owning this machine is that there are tons of instructional videos about tips and tricks for this model, which will make your projects much easier in the long run. Lastly, Singer 7258, if you are emotional about American’s favorite brand and are looking for a workhorse that won’t die on you even after ten years. As mentioned above, we have created this guide specifically keeping in mind the requirements of a novice user – you. Pro Tip – A needle threader makes the task of inserting a thread into the eye of the needle easier. You just have to hook the thread in the right spots/hooks (diagrammatic representation available in most manuals). This guide is tailored (pun unintended) for everyone who has ever thought of buying an easy-to-use, well-designed, and beginner-friendly sewing machine that is not overly complicated. Sewing in itself is a simple process; why would a machine, which exists to assist humans, intimidate us? We are better than that, aren’t we, folks? You are a homemaker who has tons of dress materials stashed in the closet waiting to be stitched, re-stitched, altered, etc. You are a motivated person who wants to start a side hustle, so why not this artful métier that none of your friends has any idea about? Everybody else who has ever dreamed of getting a sewing machine. If you have never tried sewing before or are still confused about all the technical terms we have used above, this section will ease you into the magical world of sewing. A sewing machine is basically a machine that uses mechanical force to drive a threaded needle to join two pieces of cloth together. It is capable of a variety of actions such as sewing, stitching, altering, quilting, and to some extent even embroidering and appliqueing. Technology has made modern sewing machines smaller in size and capable of hundreds of tasks. Versatility, robustness, and intelligence are the biggest features of today’s machines, and all the seven models listed above are in some way or other superior to the machines that were in use in the previous century. 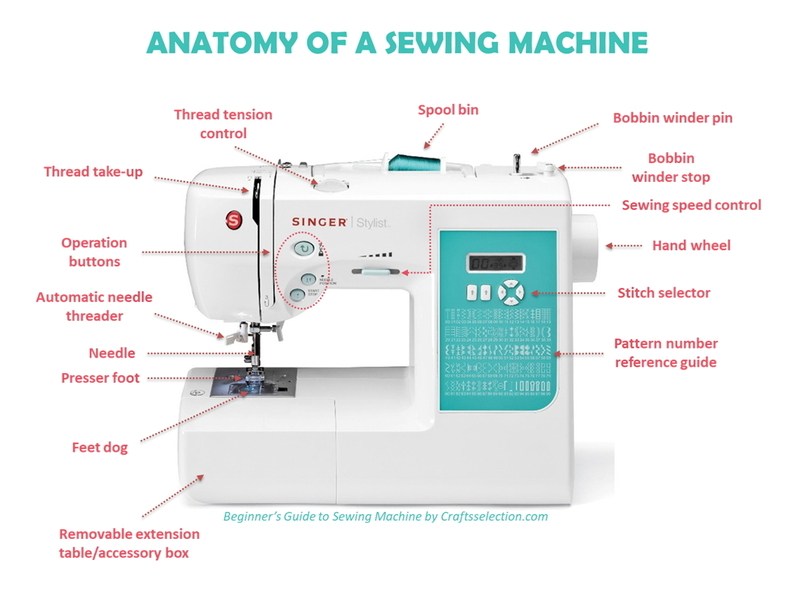 In addition to these, there is also another type of sewing machine called a serger. It is more of an advanced machine that is used by professionals and fashion designers to create stronger stitches. Most home businesspersons own a sewing embroidery machine and a serger to take care of everything related to clothes and their stitching. These are the major sewing machine parts that are common in all models. It is recommended that users read the manual carefully before operating. Read more: How to Sew With a Sewing Machine? Understand your requirements first. Do you want a basic sewing machine or something that also helps in embroidering? What are the primary purposes? Look for the attachments. Does it come with a complimentary pedal? What are the types of attachments buttonholes, presser feet? What tools are you getting? Overall, it is up to the end user and her/his requirements that will help you make a wise purchase. The most important thing is to understand one’s requirements. Can I sew thick clothes like jeans? Yes. Use an appropriate, larger needle depending upon the thickness. Can I change needles in a sewing machine? Yes. Most machines have a clamp that can be loosened/tightened to fit a new needle. Can I create my own designs in embroidery-enabled sewing machines? No. You will need a separate computer software for this purpose. Do all machines have instructional DVDs? All Brother machines come with an instructional DVD. For other brands, models, one can browse YouTube for tutorial videos. What is the difference between a free arm and a wide table? A free arm is an extension used to sew smaller, hard-to-reach clothes like sleeves. A wide table gives more space to the sewer to guide the fabric freely. A wide table is beneficial while quilting or sewing long fabrics. What does limited warranty mean? It means that there are certain conditions laid out by the manufacturer for a user to claim warranty in case of any issue with a sewing machine. It is recommended that users study the warranty card carefully. Most commercial sewing machines have a warranty period in the range of 10 to 25 years. Does buying from Amazon void the warranty? No. It totally depends on the seller and not on Amazon. What is the E5 error message? How to fix it? This error usually occurs when a user has pressed the start/stop button while connected to the foot pedal. The solution is to switch off the unit, restart it after 10 seconds, then use either the button or the pedal. What is the perfect thread for sewing? There is no perfect thread. It depends on the job type. Polyester/cotton is the most common blend. Click here for review on Best sewing threads. What should be the minimum age for a person to start using a sewing machine? Kids as young as 10 can be taught sewing, but only under adult guidance. 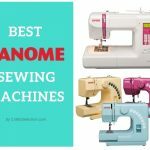 Visit this article Best Sewing Machine For Kids to find an appropriate sewing machine for your child. We hope that this brief guide will help you make a wiser decision as you finally own a sewing machine. It took us over three weeks to thoroughly research the products, gauge user sentiment, and test their usability. Therefore, you can rest assured that the sewing machine reviews you read above are entirely based on our experience. As industry experts in the field, we have been dealing with such products for several years now. We are constantly updating our buying guides to empower you – the customer – to make better decisions in your life and work. We hope that you satiate your creative needs with your new best sewing machine for beginners. Sewing is an art and owning a classy machine is a privilege.